Lake Nelson is a 40-acre impoundment located in Nelson County, Virginia. This reservoir is owned by the Virginia Department of Game and Inland Fisheries (VDGIF) and is managed primarily for fisheries related activities. Facilities available at this reservoir are a boat ramp, parking area and portable toilets which are available March-September. Bank anglers can utilize a large mowed area adjoining the parking lot, the dam and a narrow strip of VDGIF property that extends around the entire shoreline. The boundaries are marked with T posts and VDGIF property extends from the T posts to the lake. The lake is open 24 hours a day. Outboard motors use is prohibited but electric motors are permitted. The reservoir was impounded in 1958 and was stocked with various species of fish such as largemouth bass, bluegill, redear sunfish, channel catfish, and crappie. The most popular sportfish species are largemouth bass, black crappie, and sunfish. Grass carp were also introduced to control aquatic vegetation. Any grass carp caught should be immediately released unharmed. Lake Nelson was partially drained during the spring and summer of 2011 for the construction of a new emergency spillway on the dam. The partial lake draining has impacted the fish populations, primarily by reducing the number of adult bass. It will take a couple of years before the bass population is more balanced and there are noticeable improvements in the number of bass over 12 inches. Largemouth bass are abundant but most of these fish are less than 14 inches. Largemouth bass were regulated with a 14-20 inch protected slot limit but this regulation was changed to a 15 inch minimum size limit in the spring of 2009. All bass caught less than 15 inches should be immediately released unharmed. The new size limit was initiated to expand the number of bass in the lake since most bass were harvested prior to reaching 14 inches. Largemouth bass collected during Lake Nelson electrofishing surveys. The top row is the inch group and the additional rows are the number of fish collected per hour of sampling for each size group. The crappie population continues to fluctuate due to cyclic reproduction. Crappie routinely have good and bad years when it comes to spawning success especially in small lakes and Lake Nelson is not an exception. With this in mind, anglers may not know what to expect from year to year until they try their favorite crappie holes each spring. Current crappie numbers are fair but this population has experienced high harvest rates and many crappie were removed when they reached 8-inches in length. To improve the size structure and reduce the impacts of variable reproduction, a 9-inch minimum size limit was initiated in 2009. Anglers looking for crappie should check beaver lodges or shoreline structure such as fallen trees and brush piles in the spring and deeper water during other months. Crappie collected during Lake Nelson electrofishing surveys. The top row is the inch group and the additional rows are the number of fish collected per hour of sampling for each size group. 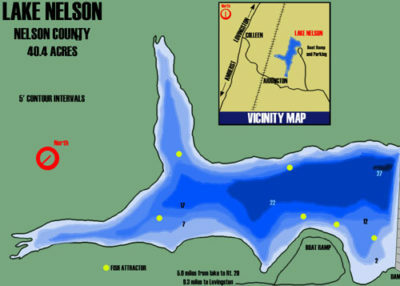 Bluegill and redear sunfish in Lake Nelson are similar to other lakes in the district. While bluegill are abundant and the dominant sunfish species, redear are also present in good numbers and tend to be slightly larger. Anglers can expect to catch good numbers of sunfish up to 8 inches. Beginning in late April and early May, sunfish begin to move shallow for spawning. Live bait such as crickets and worms work great on panfish but fly rod anglers can also be successful throwing popping bugs. Sunfish collected during Lake Nelson electrofishing surveys. The top row is the inch group and the additional rows are the number of fish collected per hour of sampling for each size group. There is a limited catfish fishery at Lake Nelson since there is no natural reproduction and the population is dependent on the stocking program. Approximately 600 channel catfish are currently stocked every year to sustain the catfish fishery. All grass carp caught must be immediately released, unharmed. Outboard motor use is prohibited – electric motors only. Facilities include parking lot with mowed bank fishing area and a boat ramp. The Department of Game and Inland Fisheries also owns a strip of land around the entire perimeter of the lake which is marked with metal T posts and the VDGIF property extends from the T posts to the lake. Visitors are permitted to use this area for fishing and wildlife viewing. Lake information and regulations are posted on a sign next to the boat ramp. New Size Limit for Largemouth Bass in 2009: Biologists attempted to improve the number of larger bass with 14-22 inch slot limit initiated in 2001. This regulation did not work as expected since too many bass were harvested prior to reaching the slot limit. Consequently, the slot limit was changed to a 15-inch minimum size limit in 2009 to increase the population by protecting additional smaller bass. New Size Limit for Crappie in 2009: Crappie at this lake are harvested at high levels and good year classes are traditionally removed quickly which causes high variability in the fishery since crappie do not spawn consistently each year. In order to extend the crappie population after poor year classes, a 9-inch minimum size limit will reduce the harvest of smaller crappie for additional fishing opportunities after poor reproduction years. New regulations for Channel Catfish 2009: Channel catfish do not reproduce at Lake Nelson and the population is sustained by stocking approximately 600 catfish per year. Regulations have been changed to a 15-inch minimum and 5 fish per day creel limit. The new regulations will allow for additional growth of stocked catfish before harvest and prevent anglers from harvesting the limited number (600 catfish per year) of small fish shortly after stocking. Lake Fertilization Program: A lake fertilization project was initiated at Lake Nelson in the spring of 2008. This project is designed to improve the production of algae and plankton which is utilized by small fish and later by larger predators. The fertilization project should improve the number and quality of fish in the reservoir. Tips for Proper Care and Handling of Trophy Bass: Some anglers are fortunate enough to catch a trophy largemouth bass. Often times, anglers will keep their trophy in a livewell and travel to one of the local stores to have their fish weighed on certified scales. Still others may keep their catch in a livewell in hopes of catching a bigger fish later that day. Anglers not wishing to have their trophy mounted will release their fish at the end of their fishing day. However, this does not guarantee that the trophy will survive. Anglers may take precautionary measures to decrease the likelihood of delayed mortality of released fish. Land the fish as soon as possible. Playing a fish to exhaustion diminishes its chance of survival. Having the proper fishing tackle is important. If you plan on weighing a fish at one of the local businesses, do so immediately after catching it. The sooner you release the fish back into the lake, the better its chance of survival. Also, holding a fish in a livewell all day and then releasing it greatly diminishes its chance of survival, especially during warmer months. To handle trophy fish, wet your hands, then use your thumb to clamp down on the bottom lip and support the fish’s weight by placing the off-hand under the fish (toward the tail). Do not hold the fish in a horizontal position just by the lower lip. Water temperatures of 75&deg;C and warmer are more stressful on fish. Run livewell aerators continuously and add ice, salt, and bacterial fungal retardant if necessary.